It's been a busy time of year around our house. So, I haven't put up our Pin the Shield on Captain America game. I could claim laziness, but really Little Elvis did something with it that I think is funny. Does this make anyone else think of anything? It makes me think of that painting of the man in the derby hat with the green apple over his face. I did a search, and it's called The Son of Man. Why else are we busy? We have another big upcoming birthday to celebrate! Dr. Seuss's birthday! They had a party at our mall, and all kids who dressed up got a free kids meal. Who likes to dress up for free meals? We do! Baby Plum donned Little Elvis' old Cat in the Hat costume. Cheese Puff was Thing 1. And poor Little Elvis was stuck with the only other thing we could think of -- Sam I am. He's wearing one of Bob's yellow dress shirts, and I attempted to cover a baseball hat with red felt. Bob made the sign. It's by far the best part of the costume. We saw one little girl with fins. I assume she was the fish. I think it was a better idea. Little Elvis was happy as Sam I am, though. And no one else dressed up as him. Here is my little conquistador. He is the messiest eater. Especially if it's something that's chocolate. Instead of savoring every bite, and making sure it gets into his mouth, he just shoves it around his mouth, and hopes that some of it makes it in. Wow. My sweet, little bitty baby isn't really a little bitty baby anymore. He's a big 1-year-old. He's almost walking, says a few words, and is trying all sorts of new foods. He's a sweet, happy baby, who at times is very outgoing. At other times, he's not. We had his birthday party on his actual birthday. We invited family over last night for pizza and birthday cake. This is Cheese Puff right before the party. He was mad at me. I'm not sure what I did, but it was obviously very bad. This is him a couple of seconds later. I'm glad I was easily forgiven. 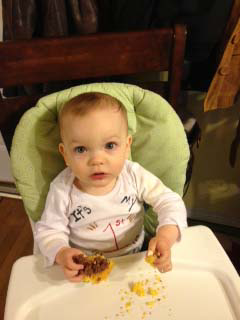 He's wearing the same onesie that I painted for Little Elvis' first birthday. Baby Plum wore at his party, too. I also made the same cake that I made for his brothers' parties. But I tried to give this one blue eyes in honor of our little blue-eyed boy. Before his party began he ate a banana and a half. I also gave him a teddy bear shaped cookie. He helped Bob eat a pizza slice during the party. He was pretty full when we put his birthday cake in front of him. "You want me to eat this, too?" "Ha Ha! I shall destroy it and throw it all over the floor, just like I do with my other foods." He did finally eat some of it. I think he liked the pizza better. I managed to get a good close-up of the sweet birthday boy after he finished throwing cake all over the place. I tried to get a long shot of him in just his onesie. See the band-aid? His mean mommy scheduled his 1-year doctor's appointment on his actual birthday. Little Elvis had his 6-year appointment as well. Fun times. 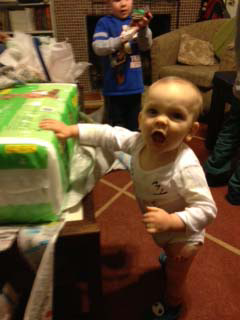 I believe his favorite present was the massive pack of diapers from Gram and Coachpa. He also got a sweet, stuffed puppy; a cute outfit, socks and money. He seemed to have fun and enjoy his party, though he really didn't know what was going on. What is this sweet boy like? He's a snuggly little baby. Both of his brothers were cuddlers. Baby Plum was more cuddly than Little Elvis, and Cheese Puff seems to be the cuddliest of all. He loves a good snuggle. He loves to give hugs, and will sometimes pat you on the back while hugging. He's most likely to do this when he's crying. I guess I pat his back when I'm comforting, so he pats back when he needs comforting. He's not quite walking. He's super-fast at crawling, pulls to a stand on just about anything, and is cruising. I think he'll be walking soon. I finally got him to use the walking toy for walking a little bit this evening. He walks with one foot turned out. I forgot to ask the doctor yesterday. Hopefully, it will correct on it's own. He is talking some! This is really surprising for us. Both of his brothers were such late talkers, that we didn't realize he was talking at first. He says bye-bye (while doing a pageant wave,) yeah and yay!, and duck. I think he's trying to say kitty-cat as well. He sometimes says, "kih-ka" when he sees one of the cats. He's also started saying Dada with regularity when he sees Bob. He will say Mama, but not as often. He's a dancer, and he mimics lots of movements that he sees. He bobs his head, shakes his head, bounces his head, bounces his body, raises the roof, claps, waves both hands, etc. He just loves music, or anything with a beat. Baby Plum and I do "Just Kids Dance 2" on the Xbox most mornings. Cheese Puff will watch, and sometimes tries to do the hand motions. It's very, very cute. On Friday morning, Little Elvis and Baby Plum started singing 50 Cent's birthday song. (I swear that I didn't teach them this. And they didn't get to the "sip Bacardi like it's your birthday.") Anyway, as they sang it, Cheese Puff started waving both hands at the same time, and swaying his head. It was so, so cute. And I didn't get it recorded, because we were headed out to pick up our carpool buddy, and I didn't have time. I tried to get him to dance to the song again, but it must have been a one time thing. Cheese Puff likes his brothers. Baby Plum is kind of a bossy overlord to his baby brother most days. He doesn't want Cheese Puff to do anything, and fusses at him and me if he thinks Cheese Puff could hurt himself. Still, Cheese Puff loves to do stuff with Baby Plum. He likes to play games with us, help us do puzzles, dance, and clean house. But Cheese Puff doesn't like when we read books. That's our biggest battle during the weekdays. Cheese Puff tries to close the book, and Baby Plum gets indignant. Little Elvis tries to dote on his baby brother, but his version of doting is to get into Cheese Puff's face. Little Elvis also loves to cry for Cheese Puff to fix his problems when he's in trouble. Cheese Puff doesn't always want Little Elvis in his face, so he's taken to pushing Little Elvis' face away. Today, we took the boys to play at the mall. Another little boy got into Cheese Puff's face. This boy was smaller than Baby Plum. I'm going to say the boy was 2-ish. Cheese Puff pushed the boy out of his face, and ended up knocking him over! He's already into self-preservation. Guess you have to be with 2 older brothers. I know this is long, so one more little thing about our sweet little baby. Sometimes he's outgoing, and other times, he's shy. On Thursday, I took the two younger boys to the library for story time. After story time, we usually go to the children's section to read books. I saw a friend that I hadn't seen since I was pregnant with Cheese Puff. I stopped to talk to her and he immediately reached for her and gave her a big hug. He'd never seen her. I'm fairly certain that made her day (although I don't think Baby Plum was happy about it.) The very next day at his doctor's appointment, the nurse looked a lot like my friend. Cheese Puff refused to go to her to be weighed. He bawled.. I can't blame the doctor's office, because he was fine for the actual appointment. He's never liked being weighed. He gets that from me. We love this little boy. I asked him all last week what would I do now that my baby was a big boy? He would just smile at me. I keep telling him that he will always be my baby. I plan to do a music video montage for him, but am still trying to think of a good song. We had talks with Little Elvis recently, and he was adamant that he wanted to play t-ball. Despite the not-so-fun soccer attempt last year, we took him at his word that he would practice. Most sports things don't come easily to him. I'm not saying he couldn't be good at sports, but he's going to have to work at it. He is like his mommy. He doesn't want to work at sports. But he is. Begrudgingly. My parents got him a cool bat for his birthday, and here he is practicing hitting with it. My parents took him and Baby Plum to a gym to practice. Oddly, Baby Plum wants nothing to do with baseball when we're trying to work with Little Elvis. My parents said Baby Plum didn't even want to climb on the wall when they were playing the other day. Little Elvis did. I like the action shot. He is getting more athletic. He just doesn't realize it. While this little boy isn't interested in helping his brother learn to catch, throw and hit, he is still really into Cookie Monster. He's also into helping me. He's been pitching fits recently when Little Elvis helps me first. It dawned on me last night that Baby Plum is my "helper." Little Elvis' new found helfpulness is taking away part of Baby Plum's identity. (I am in no way trained in this, and am possibly very wrong.) Today, I made sure that Baby Plum helped me everywhere we went. He was very happy about that. This sweet baby is almost no longer a technical baby. His first birthday is Friday. He is getting so big. He's started reaching for other people recently. It's been to play his "Grass is greener" game. That's where he wants to be passed back and forth between people. He really loves this game. He will also sometimes reach for someone while I'm holding him, and then hug me tighter. He's a tease. This isn't a super common scene in our house. Usually, when they're really doing something together, Little Elvis is all over Cheese Puff. He's very up in his brother's business at times. Baby Plum is more laid back around Cheese Puff, and has moments where he really likes to play his baby brother, and show him things. But he's also rough on "his baby." He likes to try to tackle Cheese Puff, and pull Cheese Puff around by his feet... if Cheese Puff is crawling somewhere that Baby Plum doesn't approve. Here, Baby Plum's showing Cheese Puff how to use the cash register. I'm not sure why he's putting a car in the cash register. Little Elvis is oblivious. He also wanted to show off his Pin the Shield on Captain America game. He was proud of the game he invented. My younger boys were helping me in the kitchen I guess. Cheese Puff was sitting on the floor watching me, and Baby Plum decided to join him. Routines. Those things are nice. We don't really have a good one right now. I'm pretty sure it's my fault, but I choose to blame teething, sickness, and birthday stuff. Since our routines are all out of whack, I never get a chance to get online. Well. I did for 10 minutes on Tuesday afternoon. It was Take Your Wife's Cell Phone to Work Day. I'm fairly certain that my cell phone had a much better time with Bob. The ringer was on silent, but he probably kept it in the same place every day, while I spend a good part of my every day searching for it. This is what happens when your older brother decides you should get up at 2 in the morning. Too bad your younger brother got a good night's sleep. Cheese Puff really wanted to play with Baby Plum the morning after his big stay-up-all-night shindig with Little Elvis. This is Cheese Puff's squinchy face. He does it all of the time. Instead of smiling at strangers, he now squinchies at them. Most have no idea how to react. Especially when he really gets into it! These pictures were taken after he threw up everywhere last week. It affected me a whole lot more than it affected him. I finally got us into the doctor's office. A cough isn't enough to get you in. Neither is a cough that makes you throw up two nights in a row. But a swollen throat is. Turns out he had an ear infection. Even with the ear infection, he's usually in pretty good spirits. Except at night, when he wants to nurse all night long. This little guy also had an ear infection. But they didn't want to treat it. I completely understand about the anti-bacterial resistance. But they tried to test his hearing on Tuesday and couldn't. They said his ears were too clogged. We went back to the doctor. He had a minor ear infection, and she doesn't think it had anything to do with the hearing test issues. I think she thought it was operator error. I will keep that bit of info to myself. So, Baby Plum is also on antibiotics. This sweet boy tried out for his first play last weekend. It's a children's play. He did a good job. He was loud, cute and memorable. And he got a part! He will be Icky the Dwarf. I think he's excited. I can't really tell. He loved auditioning. I think he'll enjoy having an audience. I'm concerned that he may not want to get off of the stage once he's said his lines. Not only is Baby Plum dealing with his ear pain, he's also been dealing with Middle-itis. That's what I'm calling it. Little Elvis got tons of attention last week and this Monday (his actual birthday,) and Cheese Puff gets tons because he's a cute baby. I think Baby Plum felt slighted this week. I've been trying to do a better job making sure that he knows he's loved and important. His current favorite activities are puzzles (the harder kind,) search and find books and the "dance" game on the Xbox. He likes the "5 little monkeys" song right now. And he's really impressing me with his puzzle-doing ability. He's also more shy in school than I realized. His speech therapist observed him in his class last week. She said he didn't really talk. He smiles, he plays (with the more low-key kids) and has a good time. But he's really shy. This Tuesday, the day my cell phone got a break from us (Baby Plum and Cheese Puff aren't easy on phones,) we had some friends over. Baby Plum and one of the little girls from our neighborhood had a great time playing together. Usually, they only play a little together. But they had a big time getting into stuff on Tuesday. It was fun to see him play like that with someone other than Little Elvis. I think I've caught us up from last week. Now, to get myself working on some routines. OK, Bob here for a rare cameo visit to PregnantlyPlump. I hope you enjoy Little Elvis' first foray into filmmaking. Since there aren't any bonus features or a director's cut version, I'll just give you a behind the scenes glimpse about the making of the movie. Mere did all the shooting and editing (Oscar anyone?). In coming up with the theme song, I played around with my little multi-track recorder. Mind you, I'm mostly an acoustic musician, but knew that LE would want more of a rocking tune for his movie. I pulled up a "canned" drum track and then plugged in and played a punk progression on my archtop electric guitar (running it through some distortion effects). I played the music for LE the next day and, after listening to it one time, he improvised the lyrics, sang to the chord progression and knew exactly when to wrap it up in one take. I was really impressed -- what a pro! Super America's Super 6th birthday party! Little Elvis had his 6th birthday party this afternoon. He invited 6 friends and 4 showed up. If you throw in 2 little brothers, that's 6 boys. He was happy. He wore his birthday present. It's his very own Super America outfit. It's not perfect (I don't think I can do anything perfect) but he truly loves it. That makes me happy. Cheese Puff is in the background helping us try to get Little Elvis to give us a real smile. My cousin came over and drew the star on Little Elvis' Super America birthday cake. Here he is closing his eyes and making a wish. If the wish is the same as it was last night, then he's wishing for us to build him a tree house. See Baby Plum in the background? He kind of hid at the beginning of the party, but when kids he knew showed up, he was happy to play with them. I had a hard time getting the camera to just take the picture, but when it did, the timing was good. His little cheeks are puffed out! We debuted Little Elvis' first movie at this party. So it was a super hero/worldwide movie debut party. The movie was a big hit with his friends. They laughed and wanted to watch it several times. He stood up after the first viewing and offered to answer questions. Seriously. I have no idea how he knew to do that. We will put the movie up tomorrow. It's 1 minute, and very watchable. I've seen it dozens of times, and still enjoy it. We also played pin the shield on Captain America. I'll have to get a picture of that. Bob and I drew it, and Little Elvis helped color it. The boys got to eat popcorn, cake and drink Fizzy Rainbows. Those are what you get at the soda fountain if you get some of each flavor. Bob decided to call them fizzy rainbows, and Little Elvis loves them. He picked out the soda flavors. So the boys had fizzy rainbows made out of Sprite, orange, apple, grape and peach sodas. Some of them helped him blow out his candles, and Baby Plum and at least one other helped him open his presents. He was fine with it. No fits during the party! Yay! It was a true Little Elvis party. Definitely quirky. Definitely him. And he's becoming more of our child every day. He loved his Mommy-made costume, and wishes more than anything for a Daddy-made tree house. Our baby likes our DIY-ness. At least at this point in his life. Cheese Puff isn't sleeping well. I blame his teeth, his rash, his new (bad) cough. It can't be that that's just him. I refuse to accept that. Unfortunately, he's not the only bad sleeper in house. Little Elvis kept Bob and Baby Plum up last night. Here he is showing off his bedtime friends. There's Lion Snake, Rodney the Reindeer, Lightning and Fire Truck. Rodney was a Christmas decoration that he fell in love with. Back to his bad sleeping spell. Little Elvis woke up at 2 this morning. Baby Plum was sleeping in the bed with him. So, he woke up Baby Plum. Bob heard them. (I was snuggling with Cheese Puff, and missed this.) He heard Little Elvis wake up Baby Plum. Baby Plum might have gone back to sleep, but I don't think Little Elvis let him. I woke up to the sound of Baby Plum kicking their wall at 4. Bob got mad, and they all went to the playroom for the rest of the morning. They played with their Innotabs. Bob graded papers. Cheese Puff and I were oblivious. Little Elvis was super hyper, but Baby Plum was barely able to keep his eyes open over breakfast. I told Little Elvis that he was usually cranky when he was tired, and if he got a bad report at school, then we wouldn't go to Chuck E. Cheese for his birthday on Friday. Baby Plum wasn't just exhausted, he was coughing. He didn't go to school this morning. We just dropped off Little Elvis and returned home. Baby Plum sat on the couch, and was immediately asleep. He slept until almost 11. And he woke up in a very good mood. And Little Elvis got a good report at school. So, yay. We still get to go to Chuck E. Cheese. This is Baby Plum posing with our latest project. We bought a sisal rug when we bought our house. I thought it was more environmentally friendly, but it's a big pain. The cats and boys have stained it repeatedly, and since there's no nap, we couldn't manage to get the stains out. We didn't see the point in buying another rug that would just end up stained as well. So, we painted our stained rug. We taped a big diamond design (we were trying to hide lots of stains) and painted it a rusty red color. It took a gallon and a quart of paint. But it turned out really well. We like having a darker rug, and it looks nice with our fireplace and pillow colors. We're very happy with it. I don't think the boys really care. They're pretty used to us and all of our odd projects. Hopefully they will sleep well tonight. I would hate for us to miss out on going to Chuck E. Cheese. Cheese Puff is still cutting two top teeth. They'll be his 5th and 6th. He's been cutting them for a while. That's not his first. First, some nice firsts. Baby Plum finally let Cheese Puff in his car/jeep/book thingy. Yay for Cheese Puff! This was a big score for our little baby. Then, he got to join his big brothers on Little Elvis' top bunk. We were there spotting him. The not great first? There are two. He's had a truly awful diaper rash for several days. It looked like poison ivy on Saturday night. Really bad poison ivy. I got a great tip at church about corn starch (way more helpful than the doctor's office) and he's doing much better. It's still there, but it's finally dried out. He's been getting better just in time for his first stomach bug. It happened this evening, and boy was he prolific. Bob was working late, so I called my parents to sit with him while I scrubbed the couch and myself. So far, it was a one time thing. (I know, I've written that, so now I will be punished.) My parents joked that I was making up the story about a sick baby. He was super happy with them, and only had a very small spit up while I was showering off. I reeked. I threw away an electric throw. And forgot to wash the boppy. But the couch is clean. I'm hoping that his older brothers, who slept through his cries while I tried to get some cleaning before my parents arrived, don't have it. I'm worried that I will. Little Elvis' big birthday party is Friday.